South Africa is loving social! The rainbow nation are living on Google, Facebook and YouTube in particular – these are the most visited sites. 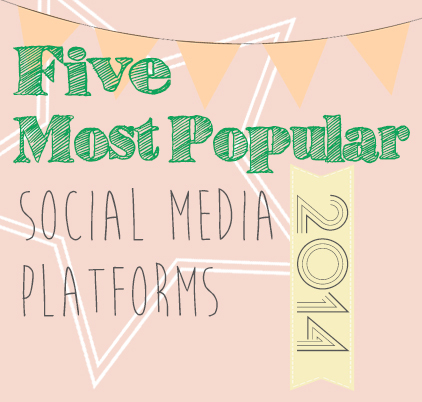 But what are the most popular social media platforms? It is essential that Internet Marketers stay up to date with these statistics so that we are able to provide clients with the best marketing platforms for their products and services. At MJ Media headquarters we put time aside every month for research on the most relevant social and SEO news to ensure we are always on top of it all…as we all know, everything digital moves really quickly! MJ Media have put together a small list of our latest 2014 research on social media platforms, perhaps this will help with your social media strategy, or maybe give you some insight into your current platforms. The break-out star of 2014 with 11,8-million active users, is, yes you guessed it – Facebook. The fastest growing group of Facebook users is the 23-26 year old age group, who are using the social platform to interact with brands, “check-in” and share photos and videos. It is also key to note that almost 90% of the users are logging on via their mobile devices, hitting home the fact that our websites all need to tick the google “mobile friendly box” in order to make user experience as good as possible. Coming a close second to the star of the show, is Google’s YouTube, with 7,2 million active South African users. The biggest problem South Africans are facing is the higher than average mobile data costs associated with our cell phones, once these come down, our video platforms will expand even more! If you or your company are producing video’s, it is important to keep them under 3 minutes to avoid a high bounce rate due to disinterest or users being put off by high costs of loading and watching longer video’s. Twitter comes in at number three on the list, with 6,6-million users. Brands are using Twitter primarily to promote competitions and sales, as well as to provide customer support, and engage their followers. Although Instagram has shown the most growth throughout 2014 (the platform grew from 680 000 active users in 2013 to 1,1-million in 2014) it still has a way to go, coming in fourth for 2014. Although Pinterest has seen a decrease in users on a global scale during 2014, they do have 840000 active users. The majority of South Africans are using the “pinning platform” for inspiration on what to wear, how to decorate their homes and searching for crafting projects too. Your Social media marketing strategy is going to depend largely on the business you are in, the age and LSM of your target market and which platforms are going to continue to grow in the future. Do you have a social strategy that needs some TLC? Are you needing to choose the right platforms for your business? Are you tired of thinking of content for your social media platforms?